Could This Be The Start Of The Mile-high Club Dating Site? Now, the Dutch are forward thinkers, and innovative, and have recently pushed a new scheme onboard based on your facebook or linkedin accounts. You are now able to sit next to like minded individuals as selected by certain parameters on your likes and information stored on your profile. Obviously this sounds like a great idea, especially if you are a talkative soul and prefer to talk to someone rather than watching that 6 month old film you’ve seen countless times on DVD again. 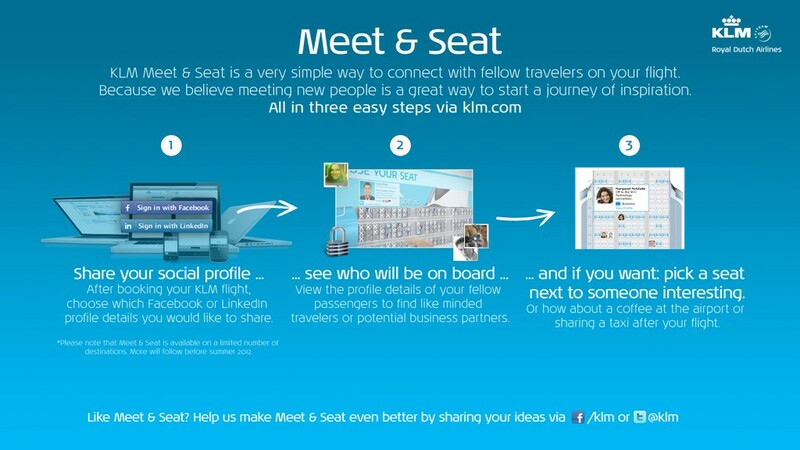 Now whilst the video that KLM like to spin is about a professional network of people, surely this is going to turn into some kind of dating / matchmaking system, where you are more likely to sit next to someone slim and attractive that you might like. Compare this scenario to that of perhaps someone a little larger, takes up your side of the arm rest, snores and has a weak bladder, but you can live happy in the fact you both like Golf. Obviously this side of the system isn’t talked about, and if you’ve already checked in, the chances are, you won’t get the opportunity to say no to the person who selects to sit next to you. There is one good side to this new technology though, and that is the concept of being able to share a taxi with someone at the end of the flight. Makes for good economic value, especially at Schiphol, where taxis require a small mortgage to get you into the heart of Amsterdam. You may be surprised to here this idea isn’t actually that new. I had the pleasure of meeting Sergio Mello, founder of Satisfly back in 2008, where he spoke to me about his forthcoming launch of his version of this product back in 2009 on Hawaiian Airlines. Whilst the concept may appear at first as a little alien, it’s actually a very logical step. It can be further used to put passengers that don’t want to be disturbed together too. Giving you better safe knowledge you don’t have to strike up a conversation with the person next to you so as to be able to climb over them to get to the toilet. Whilst I don’t think I’ll be using this as a passenger, I can see it’s merits and think an evolution of this product will probably become commonplace across all airlines, and soon at check in, we’ll be hearing “would you like to converse, or would you like privacy on this flight?” replacing the old phrase “smoking/non-smoking?”. Still confused? watch the video here!